So, venous reflux disease (picture 1) is connected with the duly operating valves, which must open to let the blood go through the veins towards the heart. If the valves do not work as they are expected in order to prevent this wrong move, the particular venous insufficiency symptoms appear showing a patient that he has problems. It happens because the valves are damaged. Usually the color and texture of the skin around legs change. The damaged area swells. The venous reflux disease can occur when as a consequence of deep vein thrombosis meaning that there are blood clots usually in legs, which can be life threatening and lead to venous leg ulcer (pictures in the gallery) formation. When we speak about venous stasis (picture 2), we mean that the blood flows too slowly in the veins. 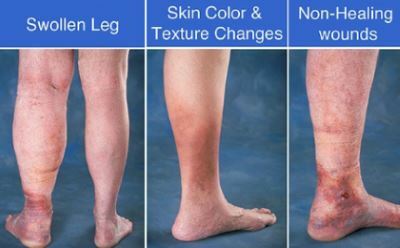 This usually happens in legs and should be ragarded as a direct risk for clots forming, which is followed by signs of varicose veins like bulging blue veins, dry skin, swelling and general discomfort in damaged areas including pain and easy fatigability. The ill legs may feel heavy when a patient stands or walks for a long time. 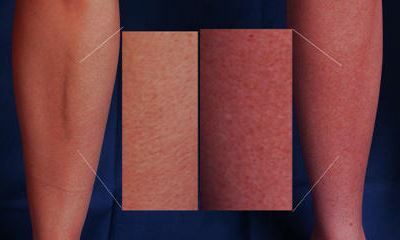 The accumulated fluid creates the increased pressure on the skin, and symptoms of venous stasis dermatitis (pictures below) appears. The skin usually around the ankles turns to be reddish. It itches and causes pain. The crust and sores develop because blood becomes static. 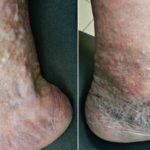 If you notice the strange swelling in lower limbs, you should turn to a doctor in order to be diagnosed as far as this is one of the early venous stasis symptoms, which have nothing in common with just water retention as many people think. 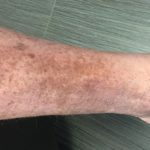 At this stage the disorder does not cause any pain, but if the venous stasis is left without proper treatment the brown spots appear on the skin, which will turn in ulcers and lesions and it will take a lot of time to heal them. The chronic venous insufficiency (picture 3) is caused by blood clot in lower leg mostly but they can form also in other areas. The point is that when the blood cannot flow in its due direction, the pools and clots appear leading to venous reflux, which in its turn becomes the most common reason for this disease. The other factors like damaged, weak leg muscles can contribute to the problem. CVI happens more often with women at the age of 40 and older and less frequent with men at 70 and more. There are additional conditions like obesity, smoking, traumas, pregnancy and family history including the chronic venous disease (pictures at the bottom). How should you understand that there are signs? When you have weak, heavy, and itchy legs, if the skin changes color and gets thicker, you observe swelling and feel pain in lower limbs, you should do a physical examination including venogram, duplex ultrasound and other efficient methods. They are usually enough to decide on chronic venous insufficiency. 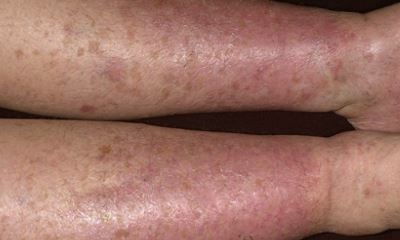 The varicose eczema (picture 4) usually occurs with adult people. It is typical of lower limbs making skin pale at the beginning. At the next stage it gets darker turning to red and brown spots appear. The damaged area becomes a litle bit bumpy and the skin thickens. Though, all the above symptoms are only visible. 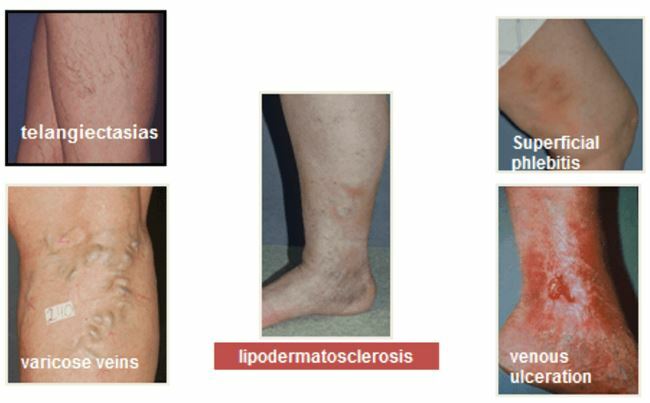 The patient suffering from varicose eczema does not feel any pain initially. Only itching can disturb. Thus, the condition is often confused with some infection and the time is lost. The skin with venous dermatitis (pictures below) is rather scaly, that is why the ulcers develop very fast and their treatment is rather difficult. In order to ease the disease, it is recommended to keep the legs up at the level of the hips or even higher, when sitting. Just put them on a chair for example. It is vital to avoid any damages of the skin and care for it applying moisturising creams. A paitane should walk a lot regularly. At that he should forget about activity connected with continuous standing. By the way if you find burst vein in leg, you’d better turn to a doctor. 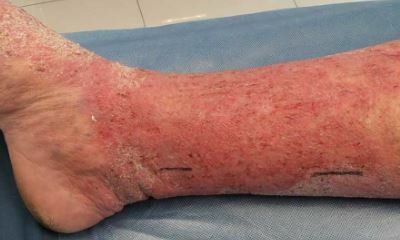 This is one of the symptoms of varicose veins, which leads to venous eczema (pictures below). There is such a natural force as gravity. It causes blood pooling in legs (picture 5) – the condition, which becomes worse if there are additional risk factors. People who have the problems with autonomic nervous system, heart disorders, damaged valves in the veins of the legs and some hormonal issues can find the symptoms of this disorder. From bad to worse – the blood stagnation leads to clotting, being one of the reasons for vascular disease legs, which become discolored and felt cold, weak and covered with painfull ulcers over time. By the way, tha pain usually occurs at night when legs are in rest and there is a lack of oxygen in legs tissues. Though, many patients do not complain of any discomfort. The blood pooling in feet (pictures below) may be treated with exercises pumping the blood back to the heart preventing that stagnation. Wearing of the compression stockings also helps. There are a range of efficient medications with this purpose. It is important to start healing as soon as possible in order to avoid varicose ulcers. 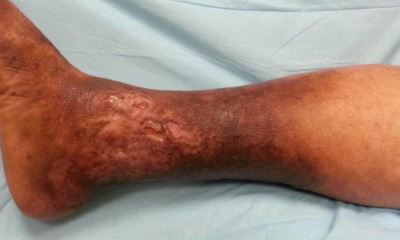 When the skin of the venouse leg gets dry and thick, a venous stasis ulcer (picture 6) may develop. It is mainly observed around the ankle. The first and efficient way to solve the problem is to ware compression bandages. The patient is recommended to continue hia active life but, when having a rest, he should keep his legs elevated. The more complicated interference is prescribed by a doctor. The venous ulcer usually occurs in older people and it is healed rather difficult. Being ignored it is able to cause severe problems with legs. 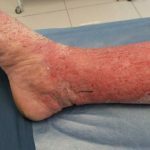 The varicose vein ulcer (pictures below) is typical but still its nature is determined only by a physician as far as various lesions are treated in different ways. When you are diagnosed with venous skin ulcer, you’ll get the individual treatment scheme. It usually includes skin care aiming at removing the inflamation, diet focusing on losing weight if there is a need in it, pills containg iron for those who suffer from anemia and other medication. The surgery for varicose veins may be recommended, the positive resulf of which help the venous insufficiency ulcer (pictures in the gal.) to repair.